The entire MEMS structure with its three degrees of freedom is only 10μm thick, according to researchers. Additional driving circuitry, an external signal conditioning board and a few stepper motors (to approach the samples) are all what would be needed to build a fully functional AFM possibly orders of magnitude simpler and cheaper than today's bulkier solutions. 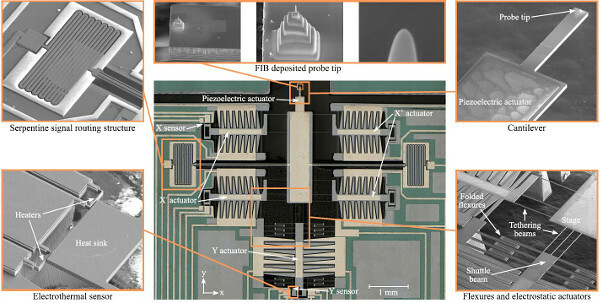 In their paper, "On-Chip Dynamic Mode Atomic Force Microscopy: A Silicon-on-Insulator MEMS Approach," published in the Journal of Microelectromechanical Systems, the researchers detailed the fabrication and characterisation of such a MEMS-based AFM probe-scanner. The main novelty is that rather than relying on the deflection of a laser beam on the back of a micro-cantilever to monitor the AFM's tip position, here the MEMS probe-stage integrates not only X-Y electrostatic actuators for scanning a sample but also a piezoelectric layer able to both actuate the micro-cantilever out-of-plane and senses its deflection. Thanks to this integrated piezoelectric feedback loop, the intricate three-degree-of-freedom design can be operated in tapping-mode, yielding topographic AFM images with an imaging range of up to 8μm × 8μm. In previous research, the authors had devised the first subsystem of an AFM, an in-plane MEMS nano-positioner with electrostatic comb-finger actuators and electrothermal sensors. They now improved their design with out-of-plane actuation (third dimension) by depositing a thin piezoelectric AlN layer on the back of the probe's supporting micro-cantilever. "Piezoelectric transduction," they write, "seems to be the only one capable of simultaneously serving as an actuator and a sensor even with a single active layer." This article first appeared on EE Times Europe.